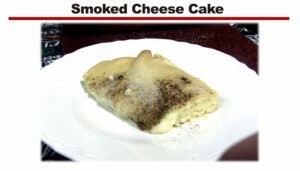 This recipe for smoked cheesecake was one of the easiest and most delicious smoked recipes we have ever made. 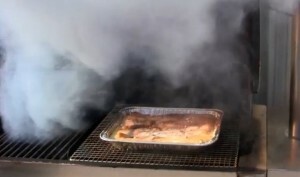 With only 6 ingredients and an hour smoke time, It’s our new favorite around the office. Combine cream cheese, sugar, butter and vanilla in a large bowl. Mix until smooth (mix by hand or use a mixer) and set aside. 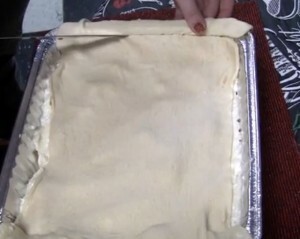 Unroll first tube of crescent rolls into the bottom of a standard cake pan (we used a half size foil pan that can be purchased on our website, part number PV703). You might have extra dough on the edges. You can either cut them off or fold them over. Pour cream cheese mixture on crescent roll crust. Unroll the second rube of crescent rolls onto the cream cheese mixture. Cut off any extra dough (if needed). Top with Cinnamon and sugar.